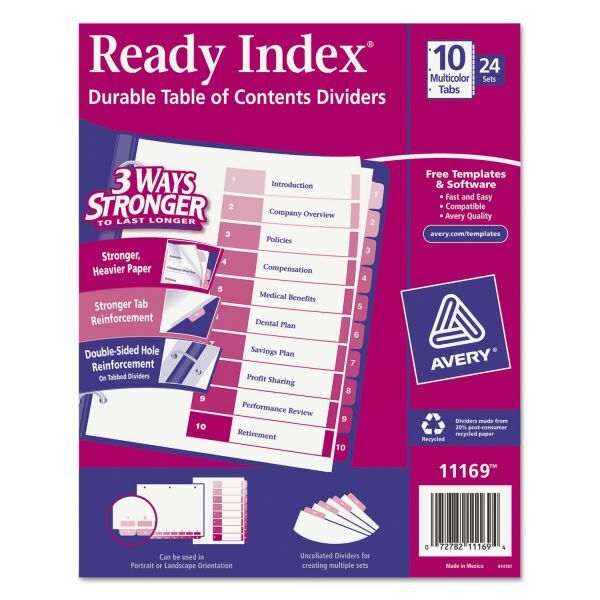 Perfect for creating multiple sets with these uncollated dividers. The coordinated system of a reinforced Table of Contents page and matching preprinted tab dividers makes referencing easy. 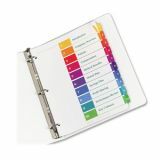 Avery Customizable TOC Ready Index Multicolor Dividers, 10-Tab, Letter, 24 Sets - Coordinating divider system makes referencing easy and delivers a professional look. 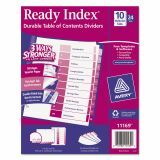 Uncollated set includes a reinforced Table of Contents page, matching preprinted tab dividers labeled, added tab reinforcement, double-sided hole reinforcement on tabbed dividers and paper made of heavy stock. 2-in-1 tab design lets you pick between portrait and landscape formats. Simply print the section titles onto the Table of Contents page using your inkjet or laser printer. Tab dividers are also compatible with typewriters and copiers. Three-hole punched for use in binders. Avery offers many easy-to-use templates for Microsoft Word and other popular software programs.